1. 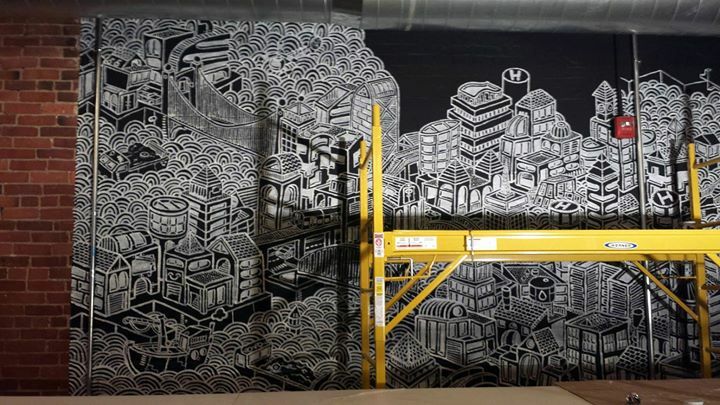 On Friday, February 26 at 6 p.m. the New Art Center is featuring artist Ben Jundanian in their gallery at 61 Washington Park for the closing party and final night of his mural project, “All Roads Lead Home.” The large-scale black and white wall drawing becomes an interactive coloring activity as visitors are invited to color it during the celebration. Free. 2. On Saturday, February 27 at 8 p.m. and Sunday February 28th at 3 p.m. the New Philharmonia Orchestra and its conductor Francisco Noya are performing at the First Baptist Church (848 Beacon Street). The concert will feature Shostakovich’s Hamlet Suite, a compilation of the original music from the 1964 Russian film. Also on the program are “The Merry Wives of Windsor” and the love scene from Berlioz’s moving “Romeo and Juliet”. Visit newphil.org or call 617-527-9717 for tickets. Adults $37; Students and Children $10. 3. On Sunday February 28th from 2-3 p.m. the Newton Free Library is hosting the Chinese Dulcimer Guzheng Youth Band in the Druker Auditorium (330 Homer Street). Students from the Boston Art School for Chinese Music will perform in celebration of the Chinese Lunar New Year. Free. 4. On Sunday February 28th at 3 p.m. the Scandinavian Cultural Center welcomes versatile violinist and teacher Tiina Kivijarvi to the Nordic Stage (206 Waltham Street). Kivijarvi graduated from the Drama and Music Institute of the Lahti University in 2012. Free. 5. Running from now until March 31 NCA members NewTV and Newton Open Studios present “LOVE” at the NewTV Gallery (23 Needham Street). “LOVE” is an exhibit that Newton Open Studio artists center on the theme of love. Visit newtv.org for gallery hours and further information. Free.